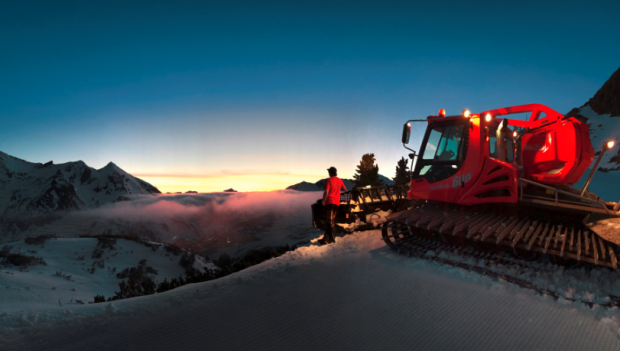 Demand for skilled specialists in the area of snow grooming is growing globally. But the “classic” courses do not appeal to everybody interested in training. There is a trend towards greater flexibility, time management and towards short learning units that can be integrated into everyday life – no matter where the learner happens to be at a given time. What could possibly beat creating a PRO ACADEMY online training course? If Florian Profanter had his say, the PRO ACADEMY would be everywhere snow groomers are in use. As the academy’s director, he believes that snow groomer drivers benefit from a top-level education in every respect. But what can be done if one-on-one support is not possible in every skiing area? The solution: simply pass on theoretical knowledge digitally. Over a user-friendly, web-based learning interface. After all, practically every- body owns a smartphone, tablet or computer. The tasks of the PRO ACADEMY are exciting and cover many facets: Not only does it have to overcome language barriers and international date lines. It also must take into account the country-specific ways of snow grooming. In this way, Europe, Scandinavia, Russia, North America, Asia and the southern hemisphere will be provided with important content using state-of- the-art learning technology. Each individual on our PRO ACADEMY team contributes extensive practical experience in snow grooming. For example, as former technical director of a ski area or as snow groomer operator at the Olympic games. Altogether, the PRO ACADEMY team commands a wealth of knowledge and is more than happy to pass it on. The manufacturer independent training courses for beginners can be accessed at any time. They provide basic knowledge about vehicles, drivers and slopes. The course content ranges from the technical workings of a snow groomer through its correct operation. It teaches efficient driving style that treats machine and environment gently and safe handling of the vehicle are notable focus areas. It is quite similar to the theoretical courses in driving schools. Who is the target group of the online beginner courses? This theoretical training puts anybody looking to work as a snow groomer operator in good hands. This lays the foundation for a professional career. After successfully passing the exam, the participants obtain a certificate that qualifies them for continuing practical training. But men and women who are just enthusiastic about snow groomers or who want to refresh their existing knowledge are also in the right place here. Are there even more plans for the PRO ACADEMY?